On May 4, 2015, a pip was noticed in one of the eggs in the morning and in a second egg in the afternoon. Rebecca appeared to stay in the nest box most of the day and waved off Kewpee when he checked in about 2 PM. The two chicks emerged from the shells about 8 PM. 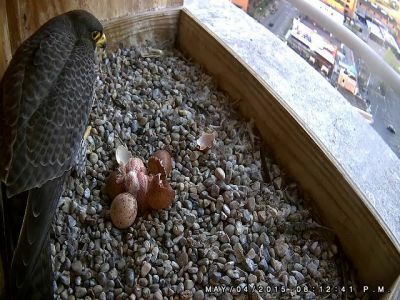 The eggs were laid over a period of a week and the remaining two eggs have not yet hatched. You can see a video of the two chicks right after hatching in the video archive.